An unborn baby’s sense of sound is one of the first sensory systems to be developed. This happens at about 17 weeks gestation. As your pregnancy advances, your unborn baby becomes aware of rhythms in music and even begins to respond differently to different types of music. Even though the real effect of music on an unborn baby is still largely debatable, many types of research suggest that music has profound benefits on an unborn baby. Music is believed to stimulate an unborn baby’s senses and promote brain development. It is one way to help strengthen brain structure as it establishes connections among nerve cells in the brain to foster learning patterns. This provides the basis for a baby to pick up sounds and languages when he or she is born. And it does not have to be classical music all the time. Some researchers claim that diversity is beneficial too. When a mum is relaxed, her body produces endorphins and serotonin which can be transferred to her baby through her placenta. This creates a conducive environment for the baby to grow. Conversely, increased stress levels result in higher levels of stress hormone (cortisol). This builds up emotional anxiety and muscle tension in an unborn baby. Unborn babies can also hear the mum’s voice the clearest as it reverberates through the bones and is amplified in the body. This makes a high-strung mum more easily detectable by her unborn baby. It is known that high-stress levels can increase the risk of premature delivery among other potential problems. Some researchers even claim that it can increase the likelihood of attention-deficit-hyperactivity disorder in a child. In your womb, your unborn baby can hear your heartbeat, air movements in and out of your lungs, as well as the flow of amniotic fluid and blood in your body. These sounds create white noise that he or she constantly hears. On top of that, there are sounds from outside of the womb. Even though music is a good thing for your unborn baby, loud music can overstimulate a baby. Many mums feel that the volume should be turned up so that her unborn baby can hear the music inside her womb clearly. However, amniotic fluid can amplify low-pitched sounds, rendering music heard in the womb to be louder. As such, the volume should be turned down to an acceptable level. Music that an unborn baby frequently listens becomes the music of choice when he or she is born. It is found that babies can remember frequently-played music up to a year after they are born. And the music tends to have a calming effect on them, helping them to fall asleep faster and for a longer time. 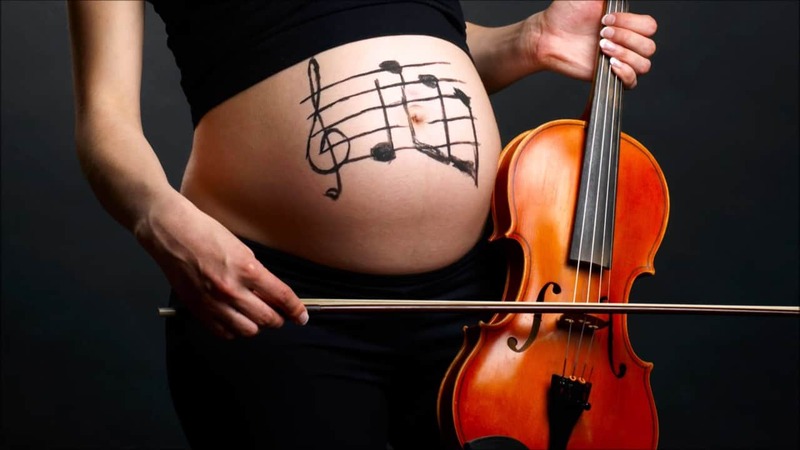 Music has many benefits for an unborn baby. More significantly, it helps to bond mother and child. As a mother, you can connect and soothe your unborn baby in a way that no one else can. So instead of going for classical music or nursery rhymes all the time, consider adding diversity to your playlist by singing a lullaby.